I’ve fallen off the wagon and gone back to my pre-diet weight. That’s right – I gained back the 4 lbs. I lost. Make that 5 lbs., because I lost another pound sometime at the beginning of the week. Then the weekend rolled around and I gained it ALL back. I must admit, I have not exactly been eating healthily nor have I been sticking to my self-imposed one serving rule. Bugger. I can’t believe I gained 5 lbs. in the span of just as many days! I started the week properly but began eating junk food and other no-nos by Wednesday. I did work out twice this week, so yay for me on that end. I even had a little workout partner! 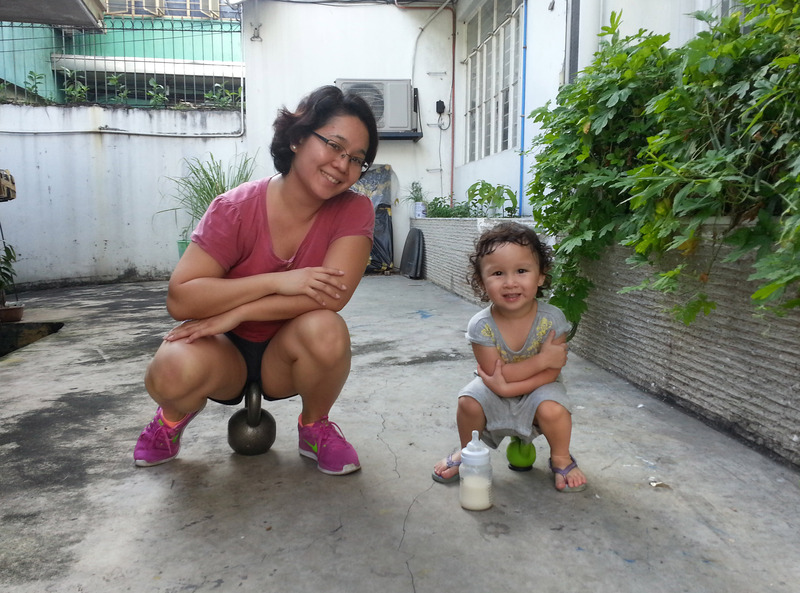 Bea has her own kettlebell (given to her by one of Julio’s friends) but, don’t worry, she is not yet allowed to even carry it. I do have to give myself a slap on the wrist for cheating (a lot!) this week. I had cake and donuts and dessert and lots of starch. Bad Ynez. So I promise to do much better this week. More veg and NO cheating at all, since I cheated almost every day last week. Let’s just keep the McDonalds double cheeseburger and fries I had for lunch yesterday a secret, deal? Just between you and me though, that meal was not at all worth it. Current Weight: 130 lbs. – again!